How to convert documents of Microsoft Office Word to mng? MNG is a kind of raster image file. It is an extension of the .PNG image format which uses indexed colors and supports image animations It is similar to an animated .GIF file, but uses higher compression and features full alpha support . If you want to convert Microsoft Office word to mng, docprint Pro(short for docPrint Document Converter Professional) is a useful tool. 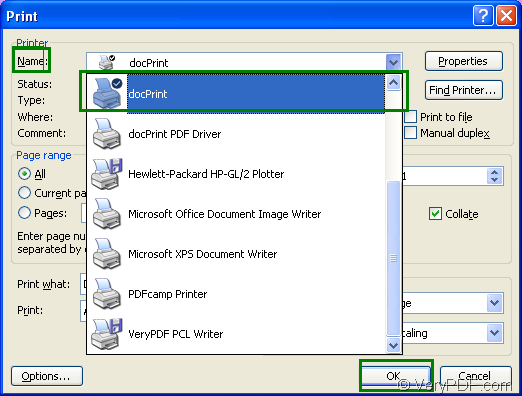 This article will introduce the process of converting word to mng with docPrint which is an application of docPrint Pro. It is not only a windows printer, but also a document converter. When you convert word to mng format file, you can just print the document to docPrint, then you are able to use the printer. Please see the following introduction. 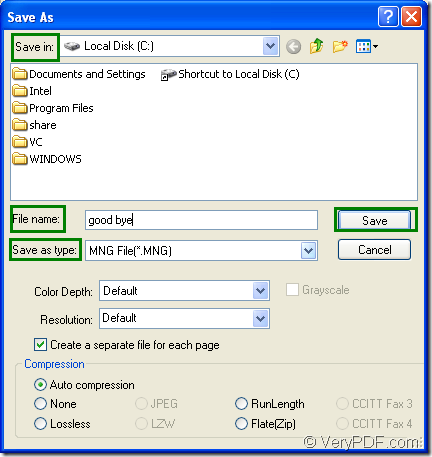 First, please find a word document in your computer and open it by double clicking on the file or right clicking to choose “Print” option in dropdown list. 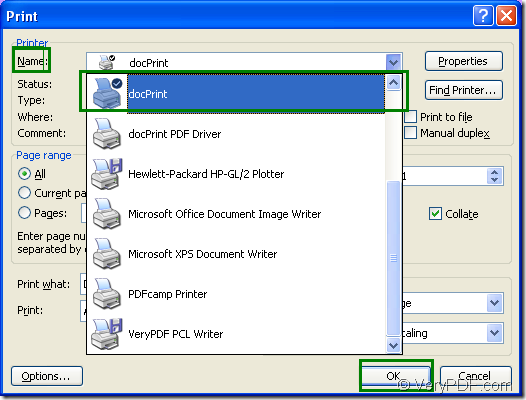 Then you can use the following methods to open “Print” dialog box in which you can choose current printer as “docPrint” and click “OK” button. Click “File” and click “Print” in dropdown list. Press “Ctrl”+ “P” on your keyboard at the same time. If you have set docPrint as your default printer, you can use the following way to run docPrint directly. Open the word file and click the icon which looks like a printer in the toolbar. Right click the word file and click “Print” instead of opening the file, which will save your time. Second, the popup “docPrint” dialog box will lead you to open “Save As” dialog box. Please see Figure2. 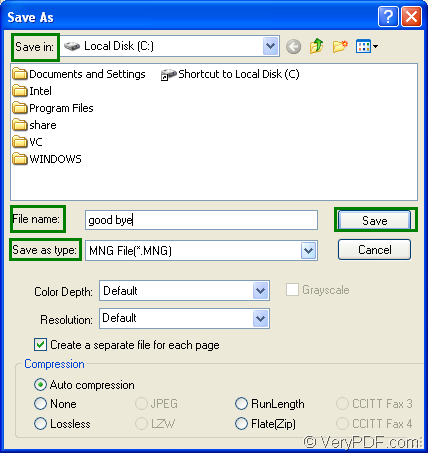 You can click “File” and click “Save as” in dropdown list. You can click the icon which looks like a floppy disk in the toolbar. The hot key “Ctrl”+ “S” will achieve the same function. In the last step, you can see “Save As” dialog box in which you should do following operations, please see Figure3. In “Save in” combo box, you should specify the directory for the target file. In “File name” edit box, you should input the name of the target file. In “Save as type” combo box, you can choose the output format for the target file. Click the “Save” button to save all the changes and run the conversion. Maybe 10 seconds later, you will see your target file. docPrint Document Converter Professional is a software product that dynamically converts MS Office 97/2000/XP/2003/2007, WordPerfect, AutoCAD DWG, PostScript, Adobe Acrobat PDF and many other document types to Adobe Acrobat PDF, PostScript, EPS, XPS, PCL, JPEG, TIFF, PNG, PCX, EMF, WMF, GIF, TGA, PIC, PCD and BMP etc formats. It works in GUI application, Command Line application and virtual printer application. With docPrint Document Converter Professional you can convert your documents from and to 50+ formats easily. If you are interested in docPrint Pro, please download it at http://www.verypdf.com/artprint/docprint_pro_setup.exe. If you want to know it more, please visit http://www.verypdf.com/artprint/index.html. How can I extract text from PDF files using Visual Basic? How can I print a HTML document to text file by PDFcamp Printer? How to convert documents of Microsoft Office Excel to GIF? How can I monitor multiple directories in docPrint Document Converter? How to print files of AutoCAD to eps file?